Event Description: An exotic place to participate in a corporate teambuilding event, San Juan — known as “La Ciudad Amurallada” (the walled city) — was founded in 1521. Location History: During the early part of the 16th century, San Juan was a key Spanish-owned territory, a launching point for voyages of expedition (or conquest) in the Americas. Its dramatic fortifications include the impressive 6-level El Morro, which repulsed the great English navigator Sir Francis Drake in 1595. To say this place has history is a striking understatement! 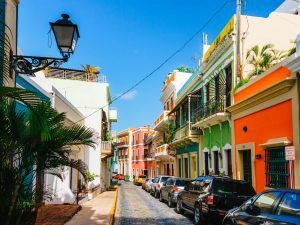 Today’s Old San Juan district combines the residential with the commercial and features cobblestone streets along with more than 400 carefully restored 16th- and 17th-century Spanish colonial buildings. During your corporate teambuilding treasure hunt… expect to encounter the El Morro Fort; a replica of Trajan’s column; statues of Juan Ponce de Leon and Christopher Columbus; and much more. Not every corporate team building program is the same. Depending on your group, your focus may be integrating new people into the team and breaking down personal boundaries and divisions. Or you may have an existing department where teams could, with a little practice, cooperate and communicate more smoothly across teams and divisions. Or you might simply have a group that thrives on the use of technology. Let Dr. Clue customize your hunt program by selecting the content focus that best matches your group and your needs. Read more about our 3 ways to customize your teambuilding event.